Shimano Lifestyle Gear is coming to the fore and it has no plans of stopping soon. Cycling apparel, footwear and pedals, eyewear, and bags are considered Shimano Lifestyle Gear. Shimano CE-S60R photochromic sunglasses are a piece of the emerging and increasingly prominent cycling eyewear, which includes an R-Series and an X-Series. During product testing, it was noticeable that the Shimano CE-S60R design is suited for a more narrow facial structure. However, through remaining snug, the sunglasses certainly remain in place without bobbing excessively. Shimano sunglasses pose a unique style when compared with additional lifestyle brands. A sleek, minimal design is presented with a focus on function, maintenance, and customization. Personal appeal and preference is just that, personal. Therefore, additional images should provide a clear view. Unfortunately, one negative observation includes the horizontal connecting bar disrupting visibility. It is noticeable that the Shimano CE-S60R sunglasses place a focus on function over design. Prominent features include photochromic lenses and a lens angle adjuster. The photochromic lenses are simply brilliant. With the ability to constantly adjust and provide optimal visibility, changes lenses is unnecessary and a thing of the past. Good for the morning, afternoon, and evening, photochromic lenses are righteous. The lens angle adjuster is an intriguing concept, which works well. Both side ear pieces have the ability to rotate up and down, which ultimately changes the lens position. Therefore, the lens angle adjuster assists in providing clarity and comfort. 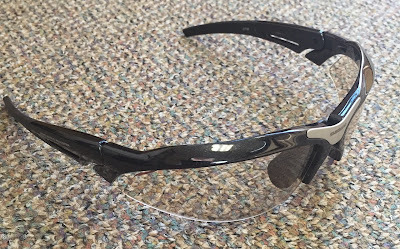 Overall, the Shimano CE-S60R photochromic sunglasses are unique and functional. With a focus on innovative features, Shimano is providing a different perspective on eyewear.